From learning how to manage eight classes and a multitude of assignments to dressing in crazy costumes for Spirit Week, 6th-graders at Prep experience a whole new world of challenge and fun. Starting with back-to-school camps, 6th-graders quickly get to know their advisors, teachers, and each other. Whether taking a leap of faith on a ropes course at Camp Shaver or tackling their long-term LEAP (Learning the Ecosystems of Albuquerque Project), they explore and experiment. At the same time, our 6th-grade team carefully tracks and supports students to ensure that this entire year of transition is smooth and successful. With our rotating schedule, each day is different. While students take eight classes, they only attend seven classes in a school day. Our schedule allows time for academics as well as activities and conversations with teachers. 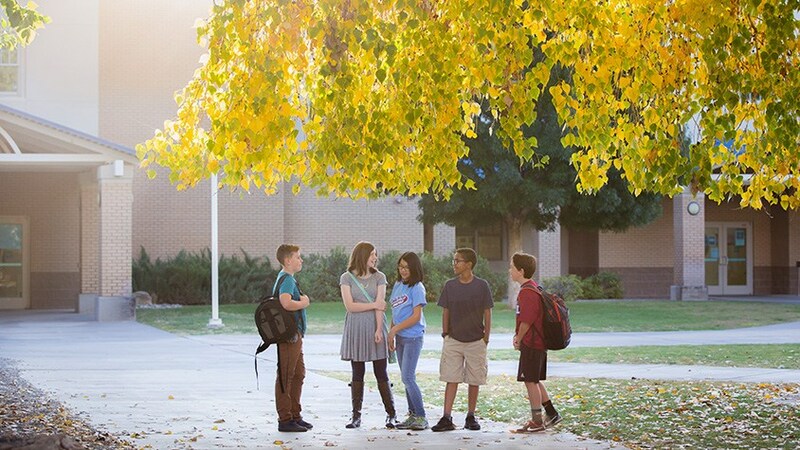 It gives students opportunities to know one another and form the strong community for which Sandia Prep is known. Along with the sixth-grade classes described above, students attend Assembly four days a week. On Wednesdays, this time is extended to thirty minutes for Advisory, to meet with advisors and fellow advisees. Twice during each six-day rotation, we set aside time for Activity period. This is a special time for students and teachers to enjoy various pursuits (rocketry, Model UN, theater, newspaper, Supercomputing Challenge, and Mock Trial, for example) while building relationships and important leadership and communication skills.